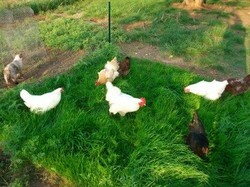 When I received my first flock of chickens from the neighbors in early 2007, I had no idea how to care for them. I had never known anyone who had chickens, so I had to do a lot of research to make certain I was raising them correctly! The Chicken Health Handbook is an invaluable book for chicken lovers and breeders. It provides detailed information on diseases, parasites and nutritional deficiencies. In addition, it tells you how to raise your birds and what to feed them. Diagnostic charts presented in a number of ways help you narrow down what possibly could be wrong. While searching for books about chicken health, I repeatedly came across the name Gail Damerow. Upon further research, I learned that Gail Damerow and her husband, Alan, live on their family farm in Tennessee. For over 40 years, the Damerows have raised all types of livestock: chickens, guineas, turkeys, rabbits and ducks. They grow most of their own food, make their own ice cream, and bake their own bread. Gail Damerow has written several animal-care guides, including The Chicken Health Handbook. She is best known for her book, Storey’s Guide To Raising Chickens, which is currently in its 3rd printing. She is also a contributor to Backyard Poultry Magazine, has written articles in more than 40 publications, such as The Mother Earth News; and is former editor of Rural Heritage magazine. With such an extensive background in raising poultry, it is clear that Gail Damerow is one of the leading experts on chicken health. Her background, along with a great recommendation from my County Extension Agent, convinced me that The Chicken Health Handbook was the book I needed. Purchasing The Chicken Health Handbook has turned out to be one of the best investments I have made. If you raise chickens, you need this book! The Chicken Health Handbook contains everything you need to take care of your chickens’ health and well-being. Whether you are raising chickens for pets, eggs or for meat, you’ll find this book covers the basics, plus more. One of the greatest things about this book is that it is easy to understand. Although there are technical terms throughout, there is a glossary at the back of the book where you can look up definitions of the terms you don’t know. The Chicken Health Handbook is also well-organized. The first two chapters cover living quarters and nutrition, and how the environment affects the health of your chickens. The following 6 chapters cover topics such as nutrition, external and internal parasites, infectious diseases, and environmental problems. Under each chapter there are subheadings, providing in-depth information on each topic. Beginning with Chapter 9, the Chicken Health Handbook offers a series of diagnostic guides. These charts are simple to use: start with the approximate age of your chicken, then look up the symptom according to what type of problem it is having — movement, breathing difficulties, etc — and the chart provides the name of the disease(s) that matches the symptom. From there, you can look up the disease by name, and you will learn how to treat it. The Chicken Health Handbook also teaches you how to treat your chickens with medications and vaccinations. Some medications can be added to their food or water, while others need to be injected, inhaled or applied to the skin. I have found that the sub-chapter on treating wounds is worth the price of the book! The final chapters of this book cover the incubation and hatching of chicks, and the problems that can arise if the heat or humidity is not correct inside the incubator. I’ve hatched several batches of chicks this way, and from experience, can tell you that it has to be done correctly, or major problems can occur! If all your efforts fail, and a number of chickens in your flock die suddenly, you might want to have a necropsy performed. This is the animal version of an autopsy. The Chicken Health Handbook has a chapter which tells you how to prepare your birds for submitting to a pathologist, and what to expect in the way of a report. It also outlines the steps you can take to perform your own necropsy. Everything you need to know about chicken breeds, anatomy, eggs and more. The photography is great, which is a plus! You will refer to this book over and over. This book covers absolutely everything you need to know about selecting chickens, raising them and keeping them healthy. It is a great companion guide to The Chicken Health Handbook. Veterinarian Advice versus Chicken Health Handbook? A few years ago, several of my chickens began having eye problems. I did not have The Chicken Health Handbook at the time, so I called a number of veterinarians to find one who treated chickens. Not many do, although I live in a rural area! I finally got an appointment, and took one of the chickens in to be diagnosed. I was given eye ointment, in addition to antibiotics to put in their drinking water. The cost for this visit? $65.00! If I had a copy of Gail Damerow's book back then, I would have been able to look up these symptoms, and purchase the medications at the local feed store. It would have been a great deal cheaper, and I’d have the same results! My recommendation? 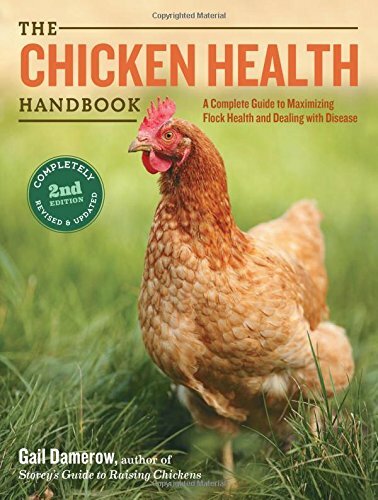 Whether you have one chicken, or if you have more, The Chicken Health Handbook should be on your bookshelf, so you can refer to it whenever you suspect a problem. It can – and will – save you a great deal of money and time.